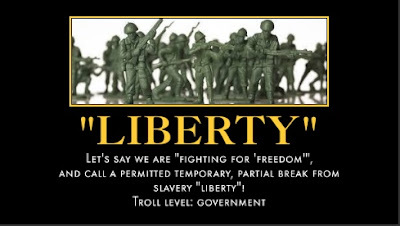 "Liberty" doesn't mean "with permission"
I've once again encountered one of those people who likes to believe that the word "liberty" means something along the lines of "with the permission of an authority". This is mostly based upon the military's long-standing intentional misuse of the word. It's similar to authoritarians' intentional misuse of the word "anarchy" to mean socialistic nihilism. And the way the word "literally" is so often used to mean "figuratively", which is literally the word's antonym; its polar opposite. Make people confused over what words mean and you can control how they think... or if they think. Freedom is doing whatever you want. Nothing more; nothing less. You can say, as some do, that freedom carries responsibility, but then it wouldn't really be freedom, since so many don't want the responsibilities, and they wouldn't be "free" to reject them. Liberty is doing what you have the right to do. And you have the right to do anything and everything which doesn't violate someone else's equal and identical rights. In this way liberty is self-limiting; there can never be "too much" liberty because you never have the liberty to violate others. But you do have the freedom to violate others if no one is holding you at gunpoint to prevent it and it's what you want to do. Because too much freedom can be a problem, and if they can get you to confuse freedom for liberty, and liberty for "with permission", they can get you lost in the swamp. If you can see the downside of too much freedom you can be manipulated into believing there can be "too much" liberty. And if you're lost in the swamp that badly you aren't a threat to them and you won't be much use to yourself. One of the worst things the military has done-- besides the mass murder, oppression, and destruction-- was to take a good word and fool people into believing it means the opposite of what it means (and even get it into the dictionary), and then convince them to fight to preserve the perverted, wrong meaning in order to keep people on the wrong track. I guess that's an example of "military intelligence"; intelligence to serve evil.